In the course of 2015 Sweden accepted approximately 160,000 refugees from Syria, Iraq, Eritrea and Afghanistan. Considered per head of population this was more than any other country in Europe. This number of immigrants has put huge pressure on the housing market, although even before this influx it had been difficult to find an inexpensive apartment. In contrast to Germany, Sweden does not restrict migrants’ freedom of movement. Anybody applying for asylum in Sweden only has to give an address, for example that of relatives or friends, where they are then allowed to move to. This means that migrants in Sweden settle in places where other migrants already live. In Germany applicants have to wait until their application has been processed. Only after they have been accepted are they free to choose where they live. Even before this the housing market was stressed. In Sweden, as in Germany, lack of housing has led to a rise in the cost of rentals. Tenants have to reckon with high rents not only in Stockholm but also in the university towns. For years now -in Germany as in Sweden – the building of new housing has not kept pace with the steep rise in the population. The gap between supply and demand is becoming ever greater. Pressure on the housing market remains high. Various factors have caused this. The Swedish economy is booming. In the second quarter of this year the economy grew by four percent. The corresponding figure for Germany was 2.1%. High growth in Sweden is caused by the monetary policy of the central bank (Riksbank). Just like the European Central Bank (EZB) the Riksbank follows a loose monetary policy. Since February 2016 the base rate in Sweden has been -0.5. In addition the bank, like the European Central Bank, has been buying government securities. This base rate policy has led to a low return on building loans, which in turn has resulted in higher property prices. When investors see margins that are barely profitable due to low interest rates, they invest in ‘concrete gold’. As a result the cost of real estate is going through the roof. Between 2010 and 2016 the cost of real estate rose at a dizzying speed by about 40%. In Gothenburg and Stockholm this trend was even more pronounced. Stockholm in addition registered the greatest population growth for many years. Between 2005 and 2010 the population of Swedish cities increased by 383,000 people. The increase in Stockholm was 120,000 people. At the end of 2016 935,600 people were living in the Swedish capital and 2,269,000 in Greater Stockholm. As the economy is booming and people have good incomes they tend to buy their own homes. In addition, in Sweden interest on home loans can be set off against tax, provided the property is lived in by the home owner. On the other hand it is extremely difficult to find a rental property because the rental market is strictly regulated. Prices have risen considerably. 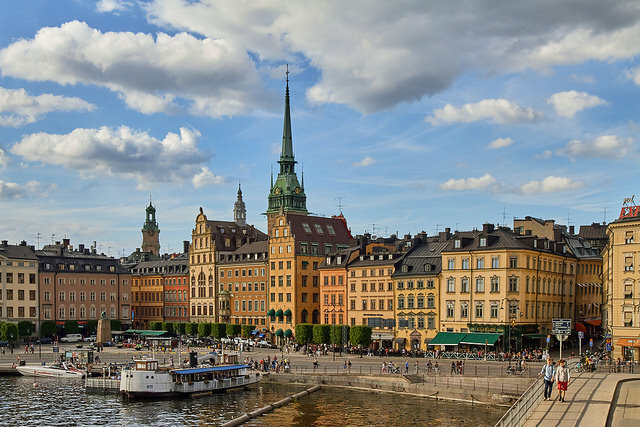 In Stockholm the rental cost of a small apartment of around 25 square metres lies, depending on its situation and fittings, between 6,000 and 10,000 Swedish Kroner (1 Euro = 9.5092 SEK ), so about 630 to 1,050 Euros (as of 25.06.2016). The trend to home ownership has led to a high level of household debt, to such an extent that the Swedish Riksbank has expressed concern. At present people in Sweden are, on average, burdened by loans of 182% of their available income, which is twice as much as in Germany. Property prices are not only rising in Stockholm but also in Malmö. An apartment was, for the first time, sold for more than 81,000 Swedish Kroner (SEK) per square metre in mid September. On average prices in central Malmö are around 40,000 SEK (about 4,203 Euro) per square metre, as reported by Branschaktuellt.se.